Aims: Secretomics will lead to an increase in understanding of how cells combine the concerted action of secreted protein networks with their internal and external environments. 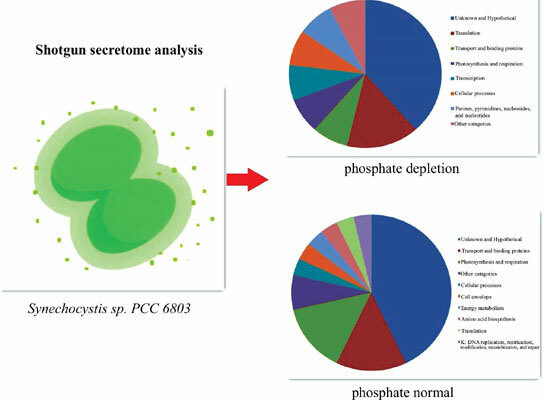 Methods: Shotgun proteomics were used to analyze Synechocystis sp. PCC 6803 secreted proteins and results showed the identification of unique proteins, 13 in normal medium and 7 in phosphate-depleted BG-11 medium, respectively. Results: Six proteins were secreted under both normal and phosphate-depleted conditions (slr0513, slr1667, sll0654, sll1694, sll1578, sll1009), but only one secreted protein (Sll1694) was commonly detected by shotgun proteomics in the present study and previous gel-based studies. Both the number of secreted proteins and their classifications decreased in phosphate-depleted conditions. The peptide count of hypothetical protein codified by slr1667 decreased significantly under phosphate-depleted conditions, whereas alkaline phosphatase protein codified by sll0654 increases significantly under phosphate- depleted conditions. Results of quantitative real-time PCR showed that the transcript level of alkaline phosphatases (sll0654) was higher in phosphate-depleted BG-11 medium than in normal medium, and the transcript level of proteins related to twitching motility decreased significantly. Conclusion: This comprehensive data set provides novel insights into the composition and function of the cyanobacterium secretome and improves understanding of the biological processes at work between cyanobacterium and its environment. Keywords: Synechocystis sp. PCC 6803, phosphate limitation, shotgun proteomics, secretome, motility, alkaline, phosphatase. Keywords:Synechocystis sp. PCC 6803, phosphate limitation, shotgun proteomics, secretome, motility, alkaline, phosphatase. Abstract:Aims: Secretomics will lead to an increase in understanding of how cells combine the concerted action of secreted protein networks with their internal and external environments.